What do you think about when I say “root vegetable”? It simply has got to be a carrot. In fact, in my mother language (Dutch) the word for carrot is “wortel”, which literally means root. Did you know that carrots were found in central Asia, more than 5000 years ago, and that they were neither orange nor sweet? Most carrots were purple, some were yellow and they really did not taste very yummy. Carrots were bitter and mainly used for medicinal purposes. Well, it is said that once carrots reached the Netherlands, Dutch botanists (those same people who were eventually responsible for all those crazy tulips) started breeding orange carrots. As we all know, orange carrots are not bitter at all. I love growing carrots, especially fall/winter carrots because they are the sweetest of all. Once you have tasted a home grown carrot, there is no going back. Unfortunately, carrots are not always easy to grow. The same carrots, all clean! First of all, you need deep, loose soil to accommodate these roots. A carrot grows by sending down a deep tap root. Only after it has reached the desired depth, will it start to grow wider and thicker. 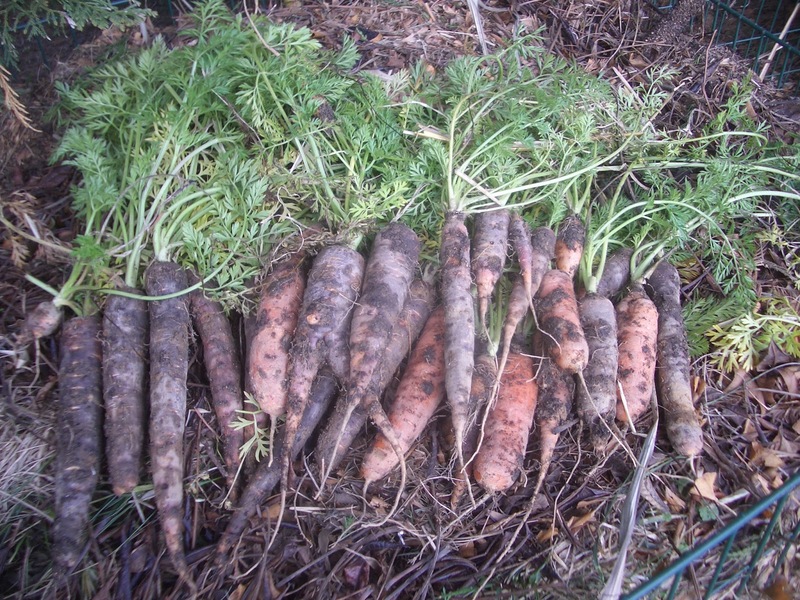 If the seed cannot establish this taproot, you will end up with short, stubby carrots. So make sure your carrots have room to grow. 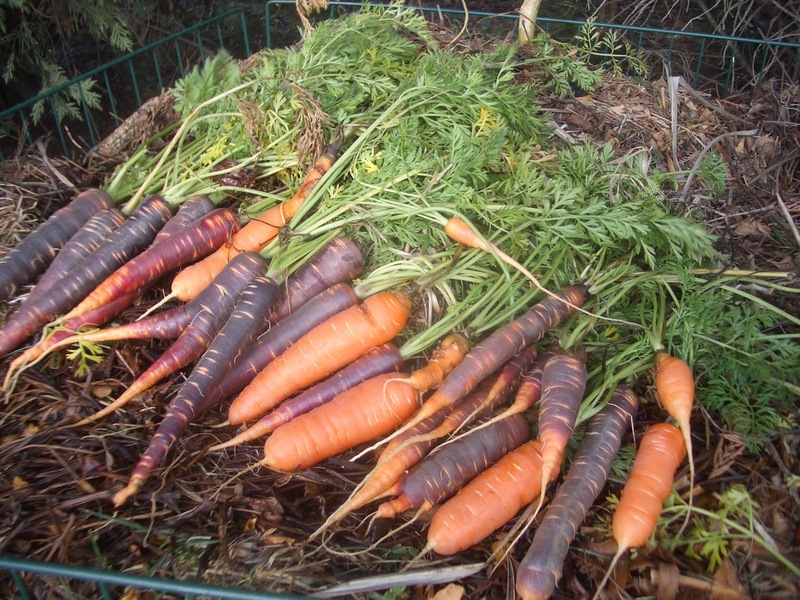 If you do have heavy soil, or you are trying to grow carrots in a container, choose one of the shorter varieties. Second, the seeds are tiny which makes sowing difficult. Some people will mix the seeds with some sand and broadcast this mixture over the planting area. No matter how careful you sow these little seeds, you are probably going to need to thin them so they will have enough room to grow. Third, carrots seeds can take quite some time to germinate. While the seeds are germinating, you cannot let the soil dry out. To improve germinating chances, you could soak the seeds overnight. This never works for me because I just do not know in advance whether I have time to spend in the garden. Sometimes I do manage to soak the seeds for several hours. Another way to keep the soil moist is to cover the planting area with floating row cover. One of my favorite carrots is ‘Purple Haze’. The color is just magnificent! If you are trying to teach children what a root looks like, exactly, I think there is no better example than ‘Purple Haze’. Thanks to the different colors, you can really see the vascular system and the root hairs. Look at the inside of a carrot! You've inspired me to plant carrots this fall, Sabine. 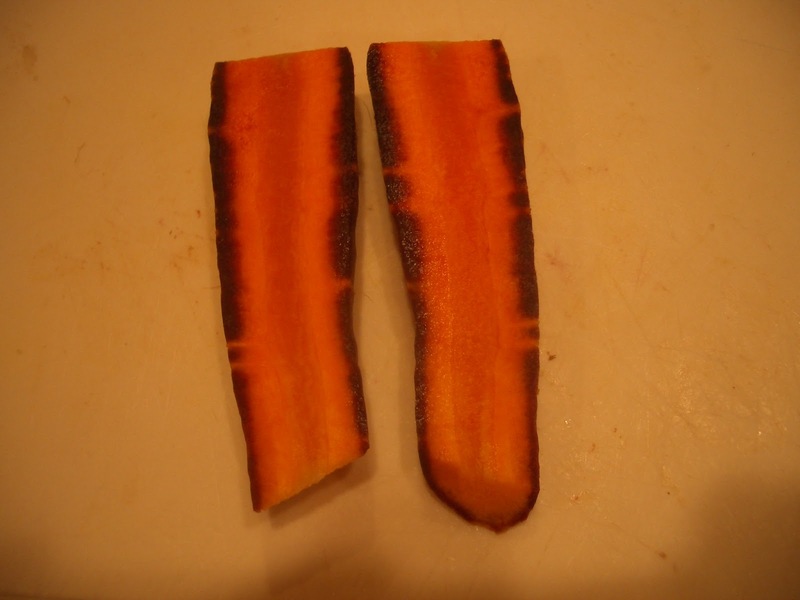 I LOVE roasted carrots wrapped in berbere and maple syrup! That sounds very yummy. My newest, favorite dish is the following: Sautee Purple Haze carrots with onions, garlic and ginger. Add Kale that has been steamed for just a few minutes. Finish with salt, pepper and a little bit of lime juice. Not only does it taste great, but the colors are amazing! This was an absolutely fabulous post! I learned so much about carrots! Thank you Sabine! I've tried (unsuccessfully) to grow carrots for several years. My soil is so full of clay. 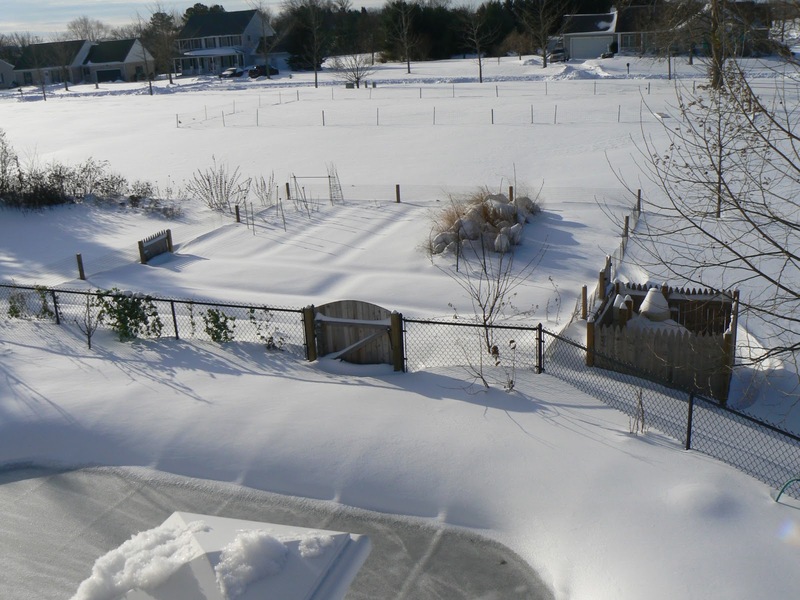 Even double-digging garden beds didn't help. BUT, I'll try them in containers! Purple Haze is beautiful–and must be delicious. My mouth waters! 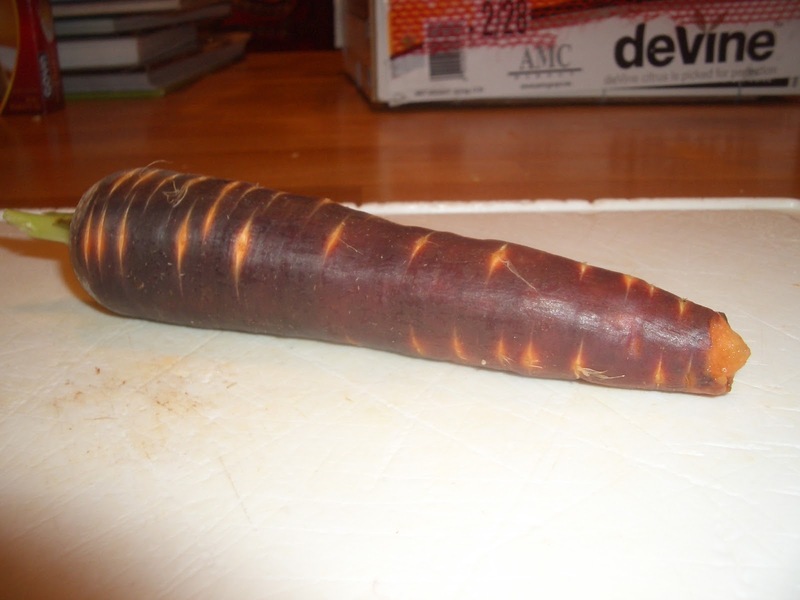 I forgot to add one word of caution about 'Purple Haze'; if you cook this carrot in any kind of liquid it will loose part of its purple color. It is not a major issue, but it does mean that the rest of the dish will turn a grey/pale purple color. You may want to reserve this carrot for roasting and sauteeing.